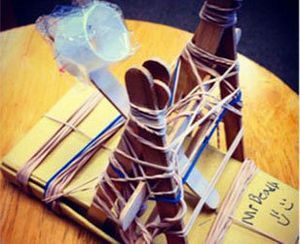 Find a new dimension to maker education with an un-makerspace, a classroom set up for dismantling obsolete technology to investigate how it works. Collaboration during the un-making process, safety gear in place. It starts with a twist, a squeak, and a cheer. Watch out, 1980s cassette player, broken computer mouse, old monitor -- my fifth graders and I are looking for you! Your future doesn't hold a dumpster in it, at least not yet. You, my memory of past innovation, get a second life. Why? For an "un-makerspace" inspired by a journey to the Bay Area Maker Faire two years ago. This Steampunk Mad-Scientists event with its many innovations, creative geniuses, and 100,000s of onlookers descended on San Mateo, California with such a wide array of inventions and innovations that it would be hard not to be inspired! Before we start taking apart the un-makerspace, we need to look at the maker movement. I love all the recent focus on makerspaces in schools. If you're not familiar with what a makerspace is, Vicki Davis created an outstanding look at this education trend. Simply put, a makerspace is a place for students to take raw materials and create "things" using their imagination. The creativity required and the "in-time" learning that a makerspace provides are powerful. I saw an example of the power of making this last school year when some of my students, who'd normally struggled in a traditional class, created things such as a working catapult fashioned out of popsicle sticks, rubber-bands and cardboard. Evan's catapult with cardboard, popsicle sticks, and rubber bands. So the making led me to "un-making." To create an un-makerspace, I simply turned my classroom into a space where kids could take things apart. So many of the creative geniuses that I met at the Bay Area Maker Faire or that I've read about speak of taking things apart when they were kids. We all have this inner drive to create an understanding of the world around us. This is founded in the desire to answer all of the "why" and "how" questions in our thoughts. Why did that little wheel spin when I pushed the play button on that cassette player? How did the electricity get from the cord into the monitor and then create a picture? My students will have a space to dissect all the discarded and unwanted items and to ask those questions. In this un-makerspace, they'll have the chance to explore the possible answers. 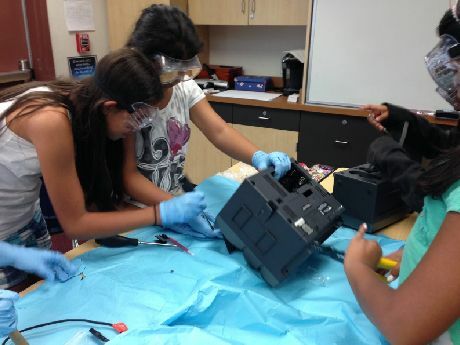 How can you create an un-makerspace in your class? Here are the seven basic steps that I took to create mine. Send out a request to your families and others in the community who may want to help. If you have a local hardware store or mechanic shop, so many people who work in these places are open to helping our schools, and they can be great resources for donations of tools like screwdrivers, wire cutters, pliers, wrenches, and hammers. I remember the first three days of wood shop and auto shop classes in high school. We talked over and over about being safe, and the dangers of tools as well as their potential. The most important step is to make sure that your students have safety equipment, including goggles and gloves. Having students collaborate on this project is a great way to learn teamwork. I use a simple document to help guide the groups through the process. It's important for me to point the kids in the direction I want them to go while allowing them autonomy to find their way during the process. Providing students with the means to log their dissections through writing, photos, and video as they explore the scientific way to take things apart is a vital piece of the lesson. I have students use iPads to document the process with video and photos. After the process is done, having the students blog about their reflection is a powerful way to see what they're thinking. Un-making provides many opportunities for learning math, writing, critical thinking, fine motor skills, and a chance to help develop a greater level of executive functioning skills (to name just a few). Decide how you can foster an atmosphere where student questions drive their desire to learn and take them in different direction. Be sure to have the proper gear for cleaning up after yourselves. You may consider using tarps or butcher paper for the students to work on as they un-make. Many of the items can still be given to an e-waste recycler if you don't find another use for them. Beyond all the learning that takes place in the un-making process, it provides opportunities for students to try rebuilding or using the parts to create something new. Maybe those parts can become a beautiful piece of remixed art, sold to raise money for another project, or even used in your makerspace just like one amazing teacher Christine Eaves does. So join us, turn up a song like ""(Un-Make It, Break It) Take It Apart" (created by Oliver Schinkten), and grab those old or broken VHS tape players before they get tossed into the dumpster. Smile when you see a keyboard that isn't working, and celebrate that old laptop with the broken screen that is out of warranty. It's all about how we look at things, our mindset, that can lead us to finding "new" in the old -- new questions to answer, new places to explore, and new learning to gain. As for those broken "unusable" things, they get a second life by becoming another learning opportunity for our students!